So we gathered under a beautiful tree on the other side of the park. 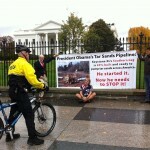 Here are my opening remarks: “Weis Addresses Climate Leaders Outside White House Demanding KXL’s Southern Leg Be Stopped.” Emphasizing that everyone there was also united against Keystone’s proposed northern leg, I pointed out that while most of the national environmental groups have been focused almost exclusively on that, the southern, and most dangerous, leg of Keystone XL has gotten 95% built. Describing the Obama administration’s cynical handling of the Keystone issue as “bait-and-switch,” I explained how the president first postponed a decision on the pipeline’s northern leg in November of 2011, only to turn around several months later and direct his administration to fast track construction of the pipeline’s southern leg. I also shared that TransCanada wants, but does not need, Keystone’s northern leg to begin pumping more than half a million barrels of toxic tar sands daily from Alberta’s mine fields to Texas port refineries by the end of this year. 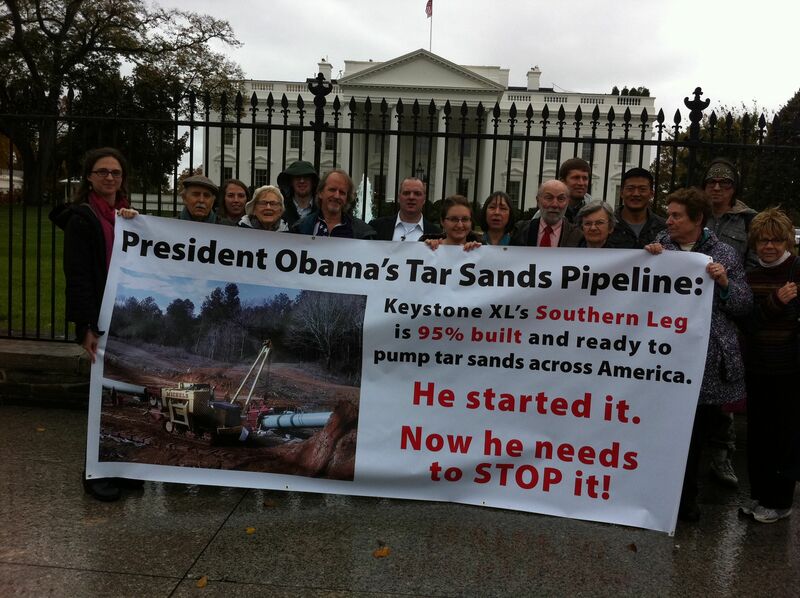 Here are some of us at the White House gate holding up a banner that gives President Obama ownership of the pipeline’s southern leg for having directed his administration to fast track its construction in 2012. The land pictured being destroyed belongs to Texas landowner Michael Bishop, who was unable to join us in Washington, DC due to a family medical emergency. I concluded with a promising update on Mike Bishop’s lawsuits to stop the southern leg, and by paying tribute to the courageous members of Tar Sands Blockade and Great Plains Tar Sands Resistance who not only put their bodies on the line, but “threw their bodies into the machine,” to stop Keystone XL’s construction. Next up was Kent Lebsock with Owe Aku (“Bring Back the Way”), an organization of Lakota Sioux people whose territory and sacred water is threatened by Keystone XL’s proposed northern leg (before the event, Kent conducted a Native ceremony in Lafayette Park to bless our gathering). Kent expressed some strategic differences of opinion over emphasizing the southern, versus northern, leg of the pipeline, along with his belief that petitions, legislation and lawsuits don’t work if they aren’t what the government wants. He urged nonviolent direct action by everyone who is serious about stopping Keystone XL, while also emphasizing that Owe Aku allies with many kinds of people using many kinds of strategies, saying people ultimately need to follow their own hearts. (Owe Aku is currently conducting nonviolent direct action training through a program called “Moccasins on the Ground” to prepare people to put their bodies on the line if TransCanada attempts to come through Lakota territory.). You can watch some of our give and take here: “Owe Aku’s Kent Lebsock & Tom Weis Talk Stopping KXL at the White House.” Kent made the point that it’s not event size that matters, reminding everyone that tens of thousands of people across the continent are united with us in their opposition to Keystone XL and other extreme methods of fossil fuel exploitation. Welcoming the airing of strategic differences, I restated my commitment (as someone who participated in “Moccasins on the Ground”) to preventing the tar sands pipeline from crossing Lakota territory. I also reiterated my view that stopping the pipeline that’s being built right now needs to be priority #1. Talking about the Cowboy & Indian Alliance that has been formed to stop Keystone, Kent said to knowing laughter, “The joke in Indian Country today amongst Red Nations people is you all are the new Indians. They’ve been taking our land for hundreds of years, so welcome to the reservation.” Emphasizing that stopping Keystone XL, or even tar sands development, is not enough, and that we need to transition off of fossil fuels as quickly as possible, I closed by saying if the Obama administration could conjure up a way to start the pipeline’s construction, they can surely conjure up a way to stop it. As we prepared for the petition delivery, I shared my plans to occupy the White House sidewalk to bear witness to this gross injustice: “White House Less Eager to Arrest Activist This Time.” My intention was to bear witness until we had a change in the heart of the man occupying the White House or until I was hauled away by security officials. Neither happened. While attempting to deliver our petition at the White House gates, we were informed by security that the White House only (rarely) accepts hand-delivered petitions that have been coordinated in advance with White House staff. I fully expected this, but figured we would take our chances, knowing how popular our cause would be with White House staff. We were told to drop the petition in the mail, which I later did. I wonder if we’ll receive the courtesy of even a form letter response from the White House this time around. 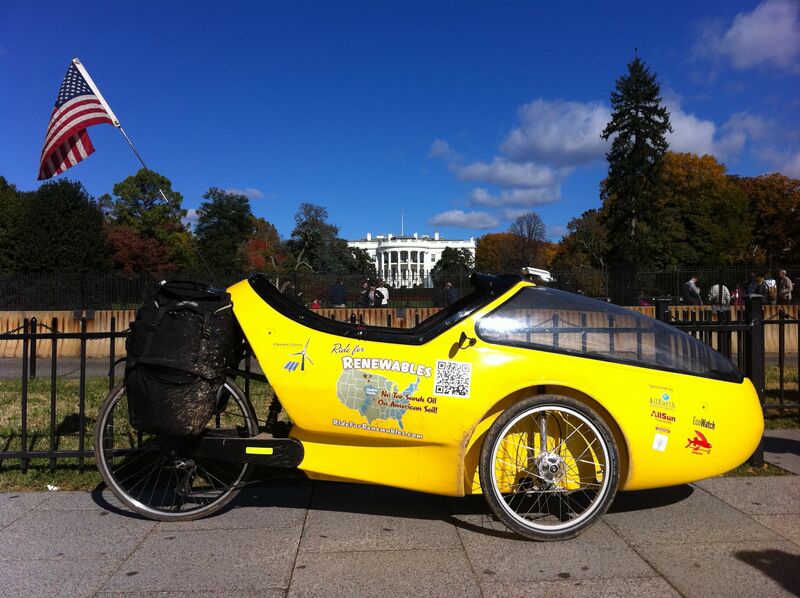 The last time I delivered a citizen petition to the Obama White House after pedaling 2,500 miles from Colorado, we didn’t. 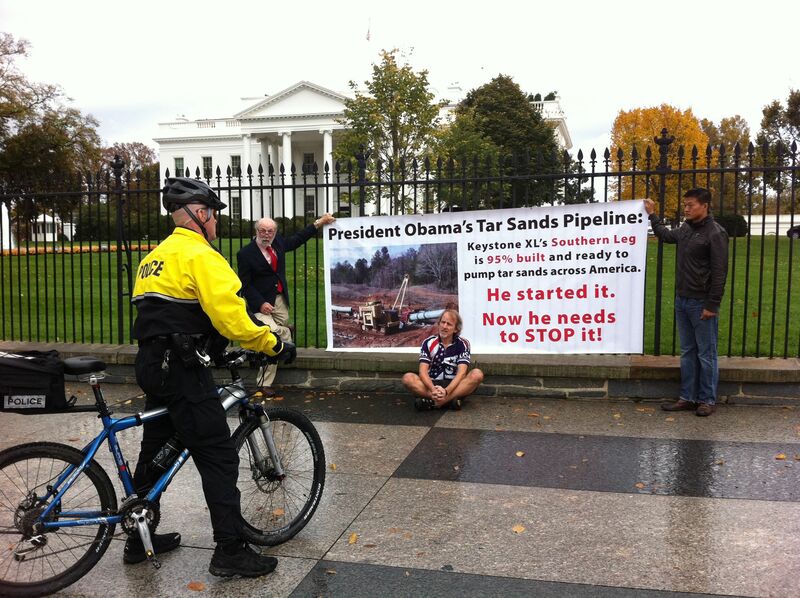 Following this, we moved to the sidewalk in front of the White House, where two climate champions, Dan Choi and Harvard Ayers, volunteered to hold up our banner while I sat down on the sidewalk. It wasn’t long before a Park Police officer confronted all three of us (pictured here), sternly warning that we would be arrested if we didn’t move. By now, a NBC News cameraman was on the scene filming the action. Harvard and Dan slowly moved with the banner, while I held my ground on the sidewalk. This went on for quite some time. Dan eventually walked over to security officials to tell them I had no intention of moving. They told him they did not want to arrest me. It’s no secret that White House officials typically go to great lengths not to arrest protesters to avoid media coverage critical of the president, and security officials were acutely aware of NBC’s live video feed taking place. I also had a demonstration permit, to legally protect others involved in our action. Harvard and I then proceeded to stand in place, holding the banner up against the White House fence (pictured here), with the NBC cameraman still filming. This, too, went on for quite some time, with no reaction from security. Feeling like we could do this forever, we eventually left, but not before I spoke with a friendly Secret Service agent who told me he remembered loading me into the paddy wagon on day one of the 2012 Keystone XL action outside the White House when 1,253 people were arrested (that time, I spent two nights in jail as part of the Obama administration’s failed attempt to intimidate future waves of KXL protesters). The agent offered to ask Park Police about the possibility of doing a “staged arrest,” but that not feeling authentic, I demurred. I want to extend a special thanks to Ann Wilcox for being our legal observer on the scene. 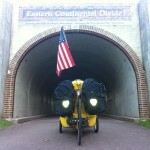 In case you only read the headline, I wasn’t serious about ending the ride 30 miles short of our goal. And I was just kidding about challenging the president to a bike race to the White House. 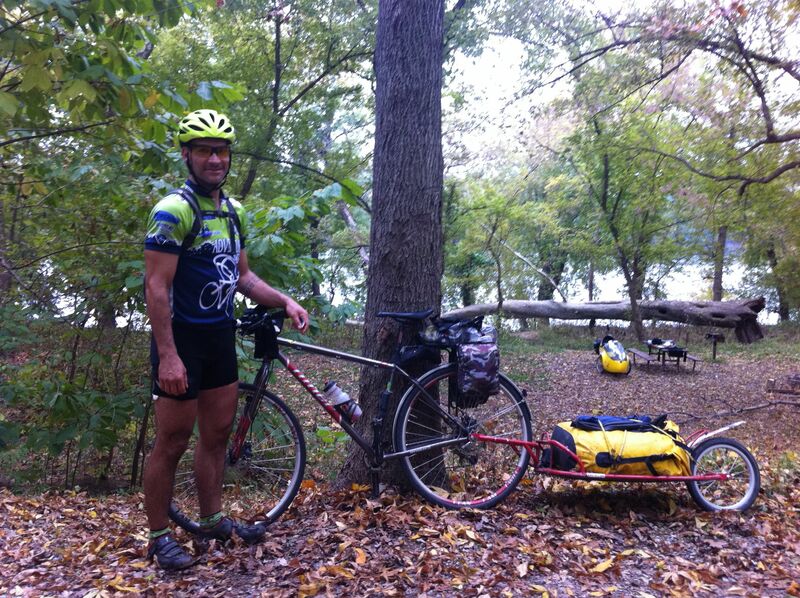 Got up early, packed up and knocked out the final 11 miles of the C&O Canal Trail. 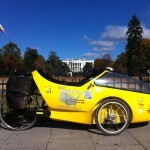 Then rolled down Pennsylvania Avenue to the White House, taking this photo to document our arrival in Washington, DC. Next up: some rest, then final preparations for Thursday’s noon event outside the White House. 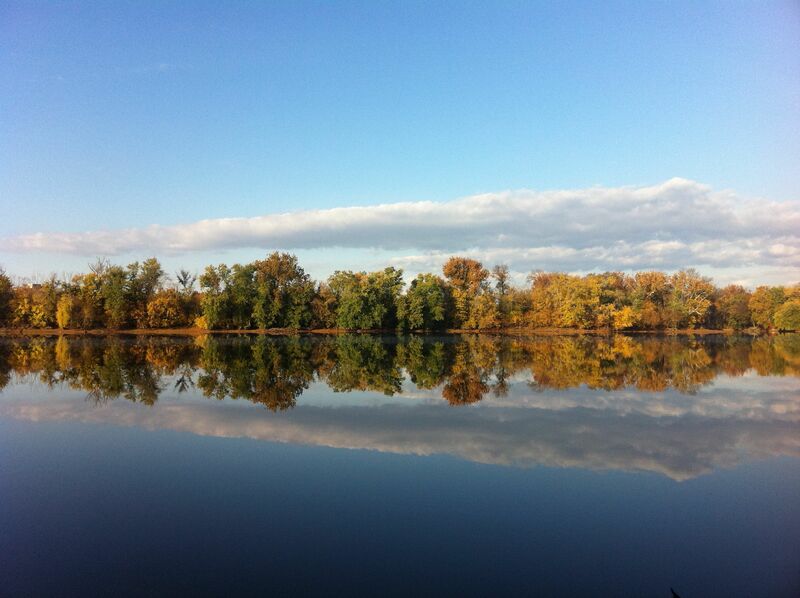 Check out the reflections (pictured here) of the fall colors on the Potomac River taken from my campsite. At the riverbank this morning, was treated to the sight of a bald eagle soaring majestically overhead in the direction I was headed. Good omen for the day. 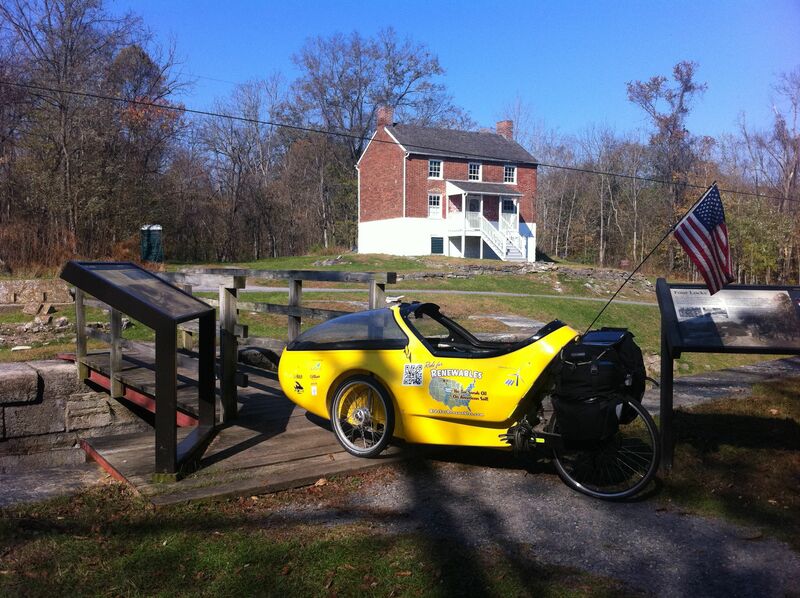 May have set a new trike speed record pedaling the 16 miles of muddy, rutted trail to the Great Falls Visitor Center, where I found a closed concession stand with an outside outlet to recharge the laptop (as you have probably discerned by now, finding recharge stations is critical). 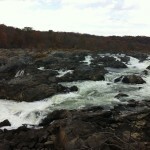 Took a stroll down the crowded boardwalk to behold the splendor of Great Falls (pictured here). Today was the best day of the trip by far for engaging people one-on-one. After four nights in a row camping out, with very little human contact, had a great reintroduction to civilization at Great Falls. People flocking to the park on this gorgeous Saturday afternoon were all but lining up to take photos of the trike, curious about where I was headed in my mud spattered craft. It was incredibly heartwarming to meet so many people who not only knew about Keystone XL’s southern leg, but enthusiastically supported it being stopped. 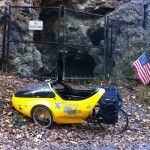 Maybe instead of pedaling all this way, I should have just put the trike on public display here 3 weeks ago! 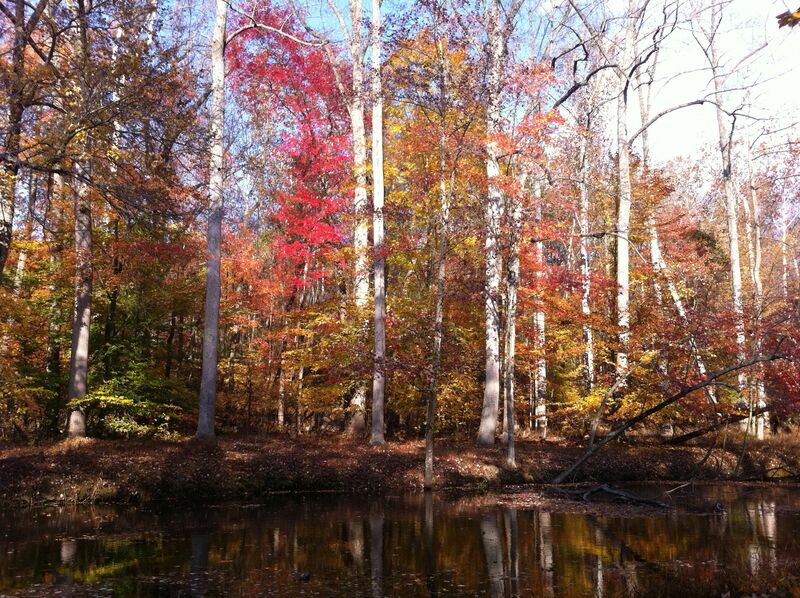 After lots of great conversation, rolled a couple of miles to the last hiker/biker campsite on the trail, Marsden Tract (feast your eyes on these fall colors). It was nice to not be the only person in the campground for a change. 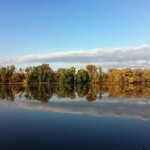 A Cub Scout troop had pitched camp nearby, so instead of the usual silence, there were happy voices ringing out as I wrote this blog. 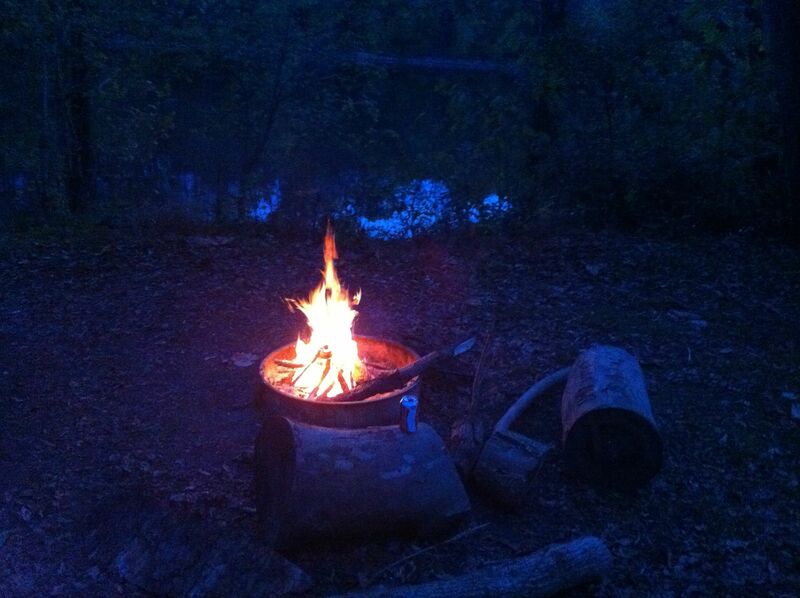 With this being my last night on the trail, had to have one last campfire (pictured here). Pedaled 19 miles closer to the White House today. Only 11 more miles to go. Rained through the night. Woke up again this morning to the sound of raindrops on the fly, but once again, it stopped as I started to stir, making for an effortless pack-up. Couldn’t have asked for better cooperation from the weather on this journey. Removing the fly from the tent, discovered a host of spiders and other critters that had taken up residence on the tent’s surface overnight. Seeing them all was truly a National Geographic moment. 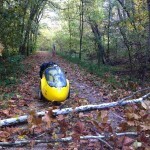 Rolled under this downed tree (pictured here) on the way out of camp in the morning. 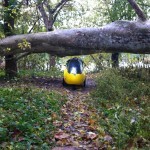 The wind from last night’s storm brought down some branches (pictured here), which I had to carry the trike over. 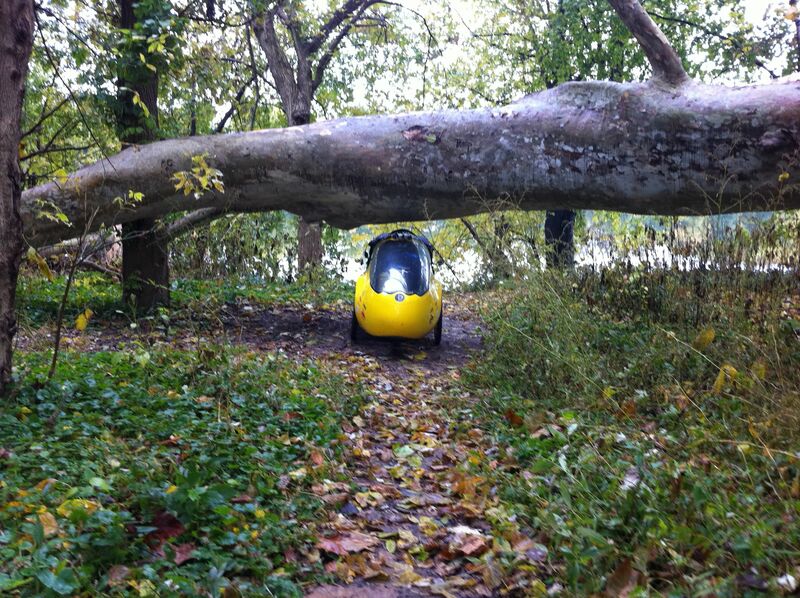 Fortunately, no large downed trees blocked the path. Grabbed some lunch, recharged the laptop and re-supplied at White’s Ferry Grille for the final stretch. The owner hooked me up with a generous discount to accommodate the dwindling bills in my wallet. Really appreciate it, Mike! OK, I’m just kidding. 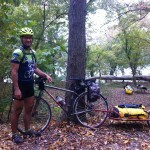 I’m pedaling the last 30 miles of the journey. I’m not going to ask the White House to come out and pick up the petition, and I certainly don’t expect President Obama to hop on a bike and race me to the White House. But I’m not kidding about who would win. To mark the 485th mile, I want to extend my heartfelt thanks to the more than 7,000 people who have taken such a principled stand in signing the petition to stop the construction of Keystone XL’s southern leg. 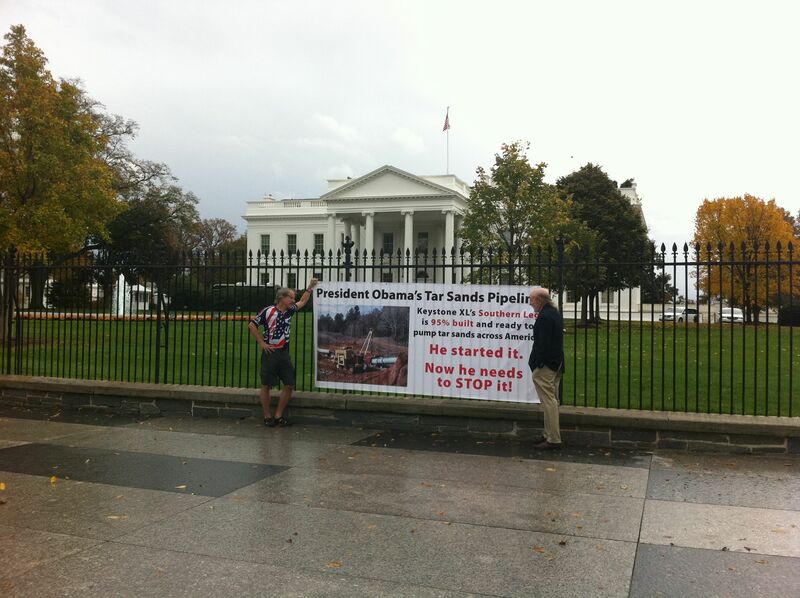 It has been a privilege and an honor to carry the petition to the White House on your behalf. 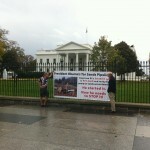 Please join us at noon on Nov. 7 outside the White House if you can. Stay tuned here for more details. An easy 13 mile day brought me to my campsite for the night, Chisel Branch, where I decided to forego a fire and hit the hay early. 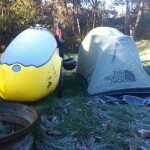 Day 17: Was awakened this morning by the sound of raindrops splattering on the tent fly. In a few minutes, the rain stopped and the sun emerged. I always seem blessed with good weather on these rides, and am grateful for it. 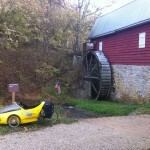 A few miles down the trail, rolled by the historic McMahon’s Mill (pictured here), an old grist mill with a water wheel. Midday, hopped off the trail into the sleepy little burg of Shepherdstown, where I spent a few hours at a local coffee shop recharging the laptop and catching up on emails. Picked up some Chinese carryout on my way out of town. As much as I like freeze dried food (seriously), its nice to have fresh food on the trail when you can. 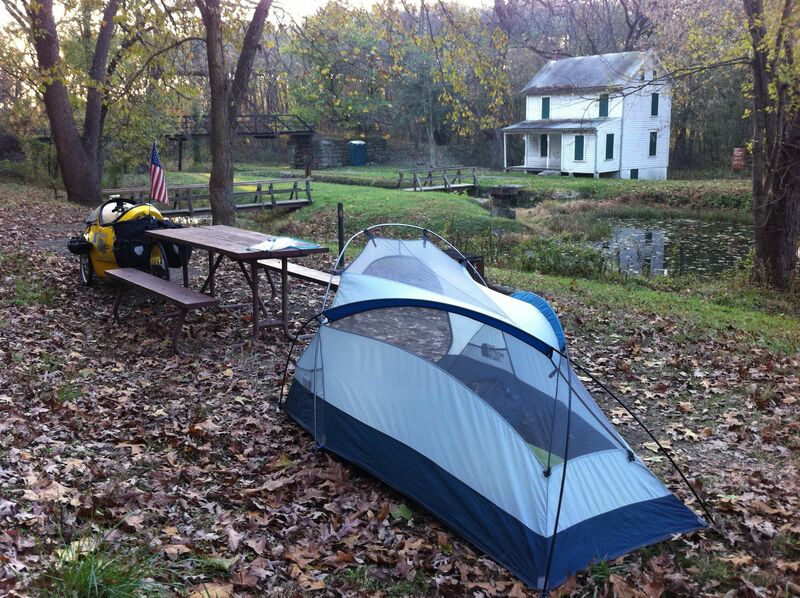 Set up camp at the Huckelberry Hill site mere feet from the Potomac. At dusk, saw a huge fish jump out of the water upstream with a splash that echoed across the water. Has me wondering what it was. The river here has a strong earthy smell, I’m guessing from the fall leaves and other detritus decaying in the water. I like it. Intentionally slowing down the pace of the ride to focus on DC preparations, but still pedaled 27 miles closer to the White House today. Saw a few other cyclists out on the trail today, but not many. Have the campsite all to myself (again). 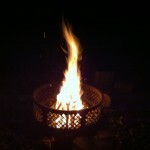 Staying warm with another campfire. It’s good to be alive. Day 16: Ever have one of those nights when your mind is racing with thoughts and you just can’t sleep? That happened to me around 5:00 am this morning, so I reluctantly climbed out of my warm sleeping bag and sat in the cold, dark screened-in bunkhouse typing thoughts into my laptop until my fingers got too cold to cooperate. My mind satisfied, I climbed back into the bag for some more sleep. Once the sun was up, rolled down the road to a diner to carb-load up with breakfast, then back to the bike hostel to pack up. 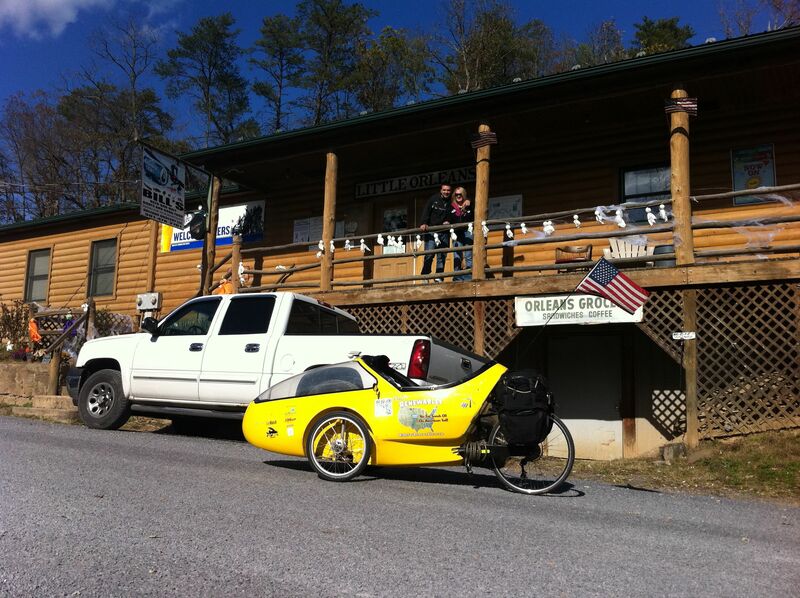 A big thanks to Liz & Johathan at C&O Bicycles for your friendly hospitality. It’s especially appreciated when you’re a solo traveler. 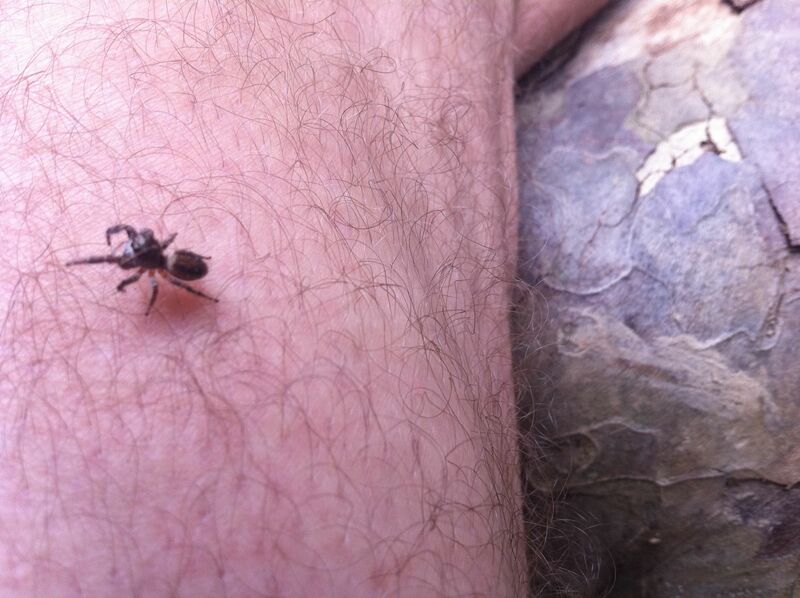 I don’t mind admitting that it can get lonely out here sometimes, so I appreciated the company. If you’re curious how fast the rocket trike can roll on a straight away, check out this video: “Rocket Trike Speed Demonstration.” It’s one of the reasons why I call it a rocket trike. Without all the gear loading it down, I could take it faster still. This afternoon, I rolled past the Lock House where I actually stayed for a couple of nights in 2010, waiting out the rain. Good to see my old haunt at Four Locks again. 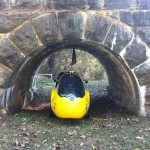 This is a cool shot of one of the small aqueducts you will find along the C&O Canal. 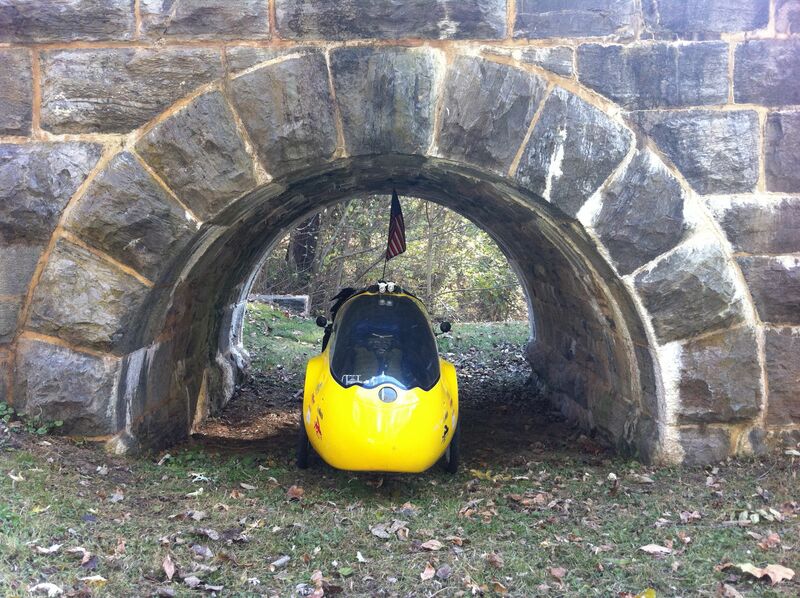 Hope you enjoy this video of the rocket trike being negotiated over one of the aqueducts along the C&O Canal: “Rocket Triking Across C&O Aqueduct.” Signs caution cyclists to walk bikes across, due to the 8’ drop-off, but it’s easy if you watch where you’re going. 34 miles closer to the White House, decided to call it an early day and get my blogging done during the daylight hours to enjoy the evening for a change. 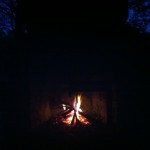 Built a nice fire to eat dinner by (do you see the “burning man” in the fire?). 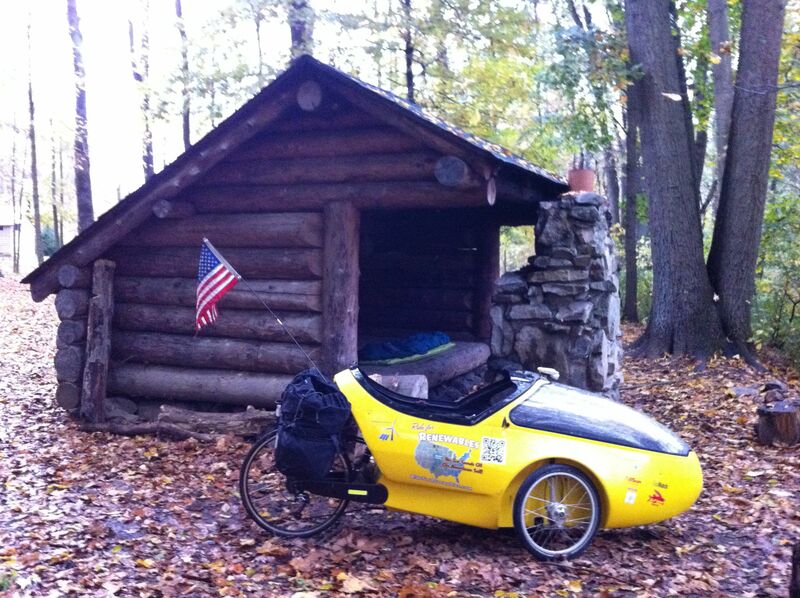 Some of these trailside campgrounds are really trail side. My site at Opequon Junction is just 20 feet from the trail, with the Potomac (pictured in background) flowing slowly by not much further away in the other direction. What a beautiful, peaceful evening away from the noisy world. Day 15: Cocooned in the sleeping bag until the sun could do its thing, then strolled down to the local Subway to set up shop and post the last four days worth of blogs. 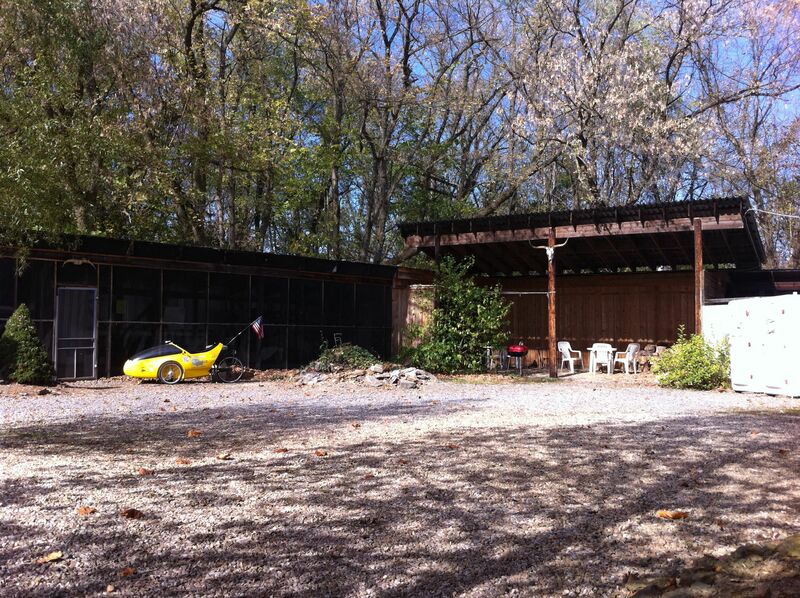 Spent most of the day at an outdoor bike hostel bunkhouse (pictured here) in Hancock, MD making preparations for DC. Grateful for the rest day, before the final push. 391 miles down. About 100 left to go. With half of the 485-mile journey now behind me, I am extremely grateful for the enthusiasm of those planning to join us outside the White House on Nov. 7. If you are a petition signer, and would like to join us, please contact me directly for details or stay tuned to RideForRenewables.com. What we may lack in quantity when we gather in DC, we will more than make up for in quality. Some have already left the stadium, thinking it’s too late to stop a pipeline that is already 95% built. Our team is down 26-14 with 5:08 left in the game. We have a first-and-goal at the four-yard line and are driving for a score, when our quarterback fumbles away the Keystone ball. Many teams at this point would just give up. Instead, our TSB defense stands firm and holds TransCanada to a three-and-out, but we burn two precious time outs stopping the clock. We get the ball back at our own 28-yard line with 3:52 remaining. After a 12-yard run and several pass completions, our quarterback scrambles for 21 yards. This time on first and goal, we punch the ball in for a touchdown and now trail 26-21 with time running out. Our onside kick attempt fails with 2:16 remaining, but our GPTSR defense again holds strong, refusing to allow TransCanada a game winning first down. After a short punt, we call for a fair catch at our 15-yard line. The game clock now reads 0:14. Our quarterback drops back and hits a receiver for 21 yards. Hurrying to the line of scrimmage, he spikes the ball to stop the clock. We’re now at our own 36-yard line with 0:06 left in the game. Our quarterback gets the play call: “Jets, Rocket, Victory.” Dancing behind the line of scrimmage, he buys time for three receivers to get to the end zone, then rockets the ball from the 27-yard line. WATCH what happens next (one of the greatest plays in the history of the game). There’s a reason why teams practice Hail Mary passes: sometimes they work. Stopping Keystone XL and lethal tar sands exploitation is not a game, but just as I never stopped believing Colorado would prevail in that classic showdown, so am I convinced that we can still prevent the southern leg of KXL from coming on line, but we need our strongest players on the field. Please support our team however you can. P.S. It’s snowing outside here in Pennsylvania and I need to get back on the trail. I’m 1/2 way to DC, but only 1/4 of the way to raising my budget. 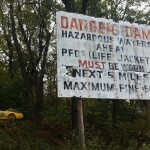 You can help power me the rest of the way by donating a penny, a dime, or a dollar a mile here. 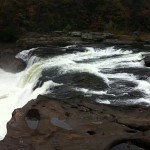 Day 11: Spent a second day in Ohiopyle, PA making preparations for DC and waiting out the cold, wet weather. 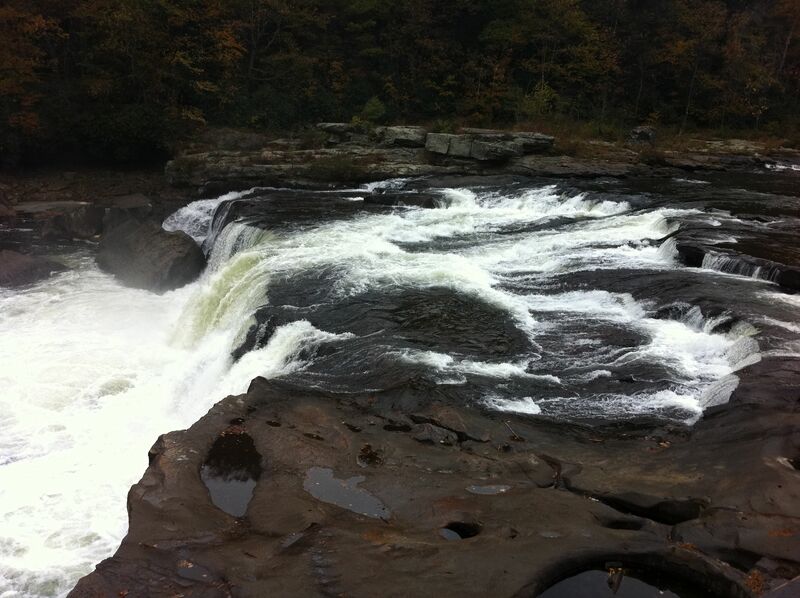 The loose Native translation for Ohiopyle is “white, frothy water,” inspired by Ohiopyle Falls (pictured here), a popular run for skilled local kayakers. I’d love to get back here someday and paddle the Loop. Day 12: Woke up to a light snow this morning, which I’ll take over cold rain any day, as long as it doesn’t accumulate. The trike’s shell does a great job of holding in the heat you generate while pedaling, meaning even on cold days you only get chilled when you stop. 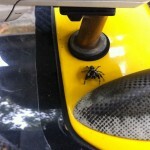 The flip side, of course, is you sometimes feel like you’re pedaling in a sauna when it’s hot out. After sending out my “½ way there” update to friends and colleagues, packed up my gear, carb-load with breakfast in town and hit the path. 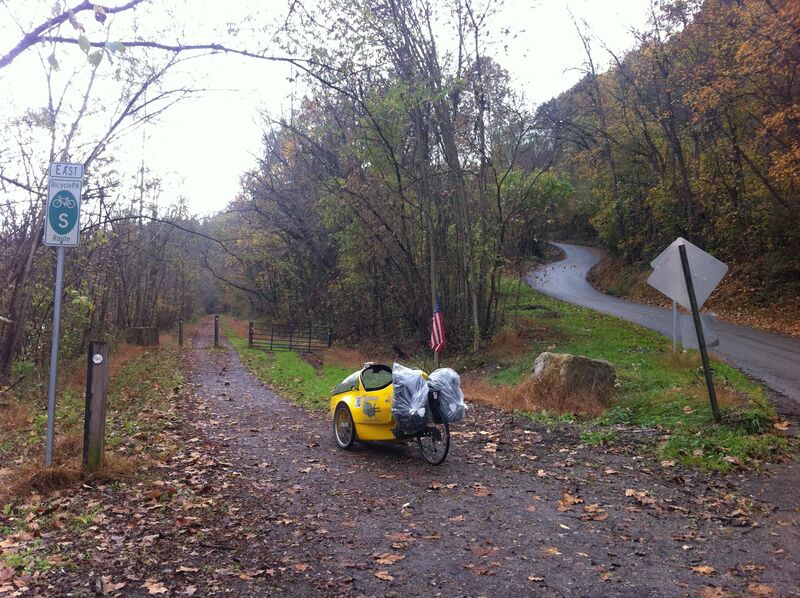 Here’s a short video I took of what it was like pedaling the trike over the leaf-strewn Great Allegheny Passage en route to the White House: “Ride Through the Woods.” Encountered almost more rifle-toting hunters on the trail today than cyclists. 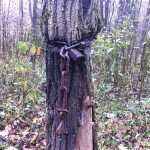 Pedaling down the trail, I witnessed something that literally stopped me in my tracks. This image speaks volumes to me. 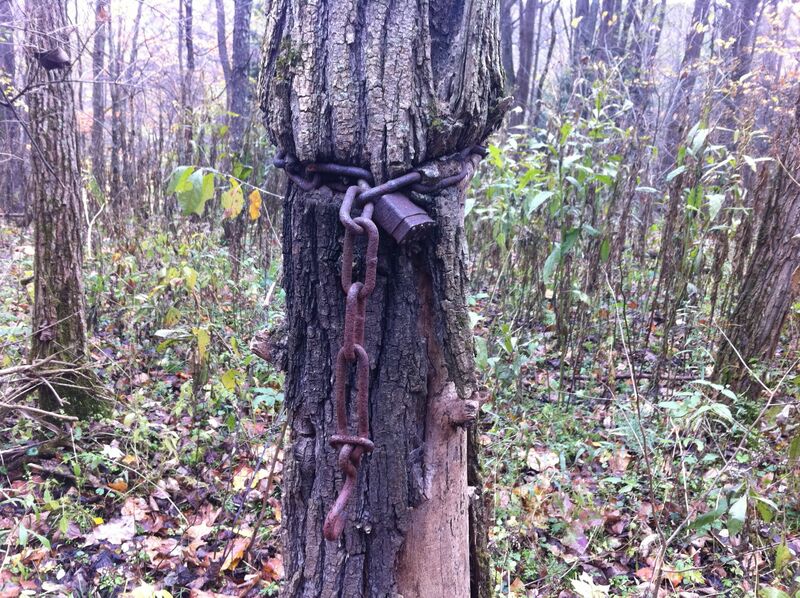 Not surprisingly, the tree this lock and chain strangled is dead. To me, it powerfully symbolizes how humans are treating Mother Earth, who provides us with everything we need to live rich, happy lives. Instead of responding with gratitude, we desecrate her, like the careless person who did this. I’m not assuming this was done with ill intent, but the end result is the same. If we don’t wake up and start treating the planet with respect, I believe Earth will simply shake us off, like so much dust, before she allows herself to expire, like this tree. But pedaling through Pennsylvania coal country and seeing wind farms left and right gives one cause for hope. 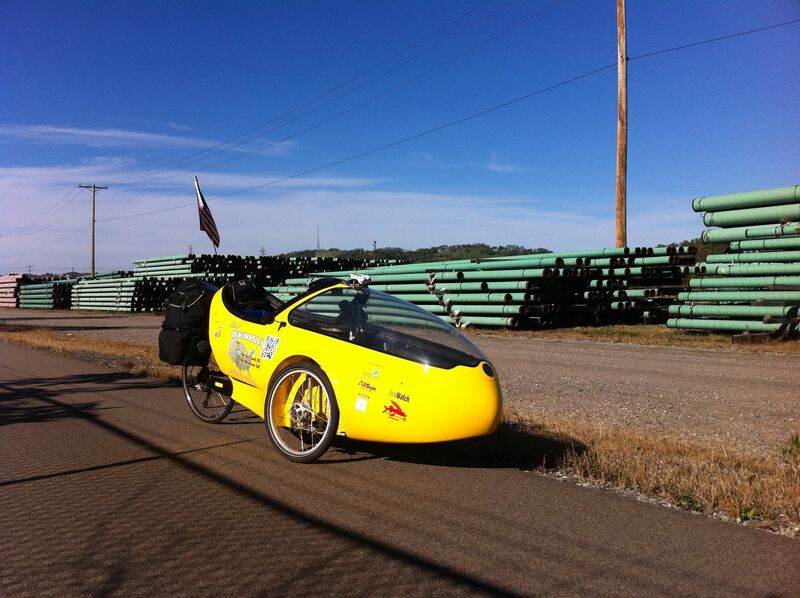 I really liked this image of the trike emerging from a tunnel to the view of a wind turbine towering on the horizon, with the tunnel representing the fossil fuel paradigm we’re living though today and the wind turbine representing the green energy future awaiting us. It’s a great metaphor for where we can go quickly, if we so choose. 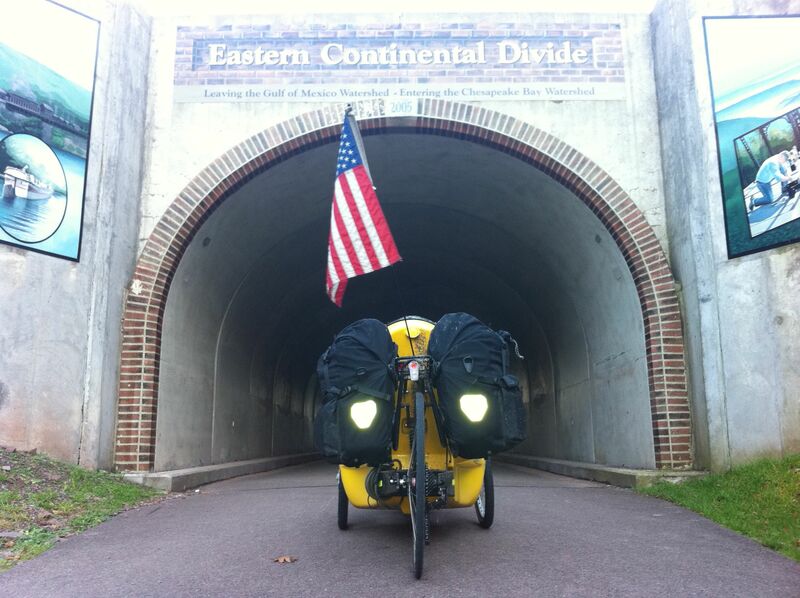 Excited to reach the Eastern Continental Divide (pictured here), because it’s all down hill to DC from here. 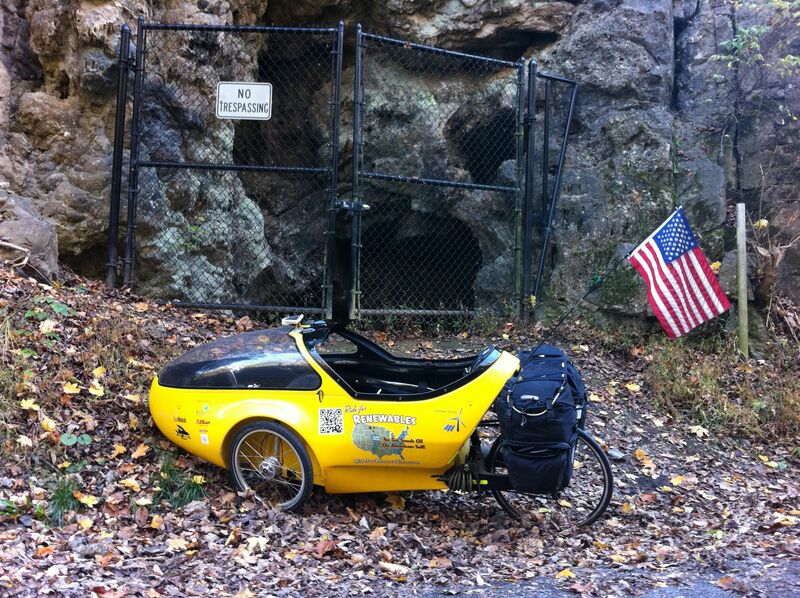 Was a treat racing down the eastern side of the divide and not having to pedal every second to make progress. My sore knees thanked me. But I remember well from 2010 how much serious effort still awaits me on the C&O Canal Trail, where many sections of the track are too narrow to accommodate my front two wheels. 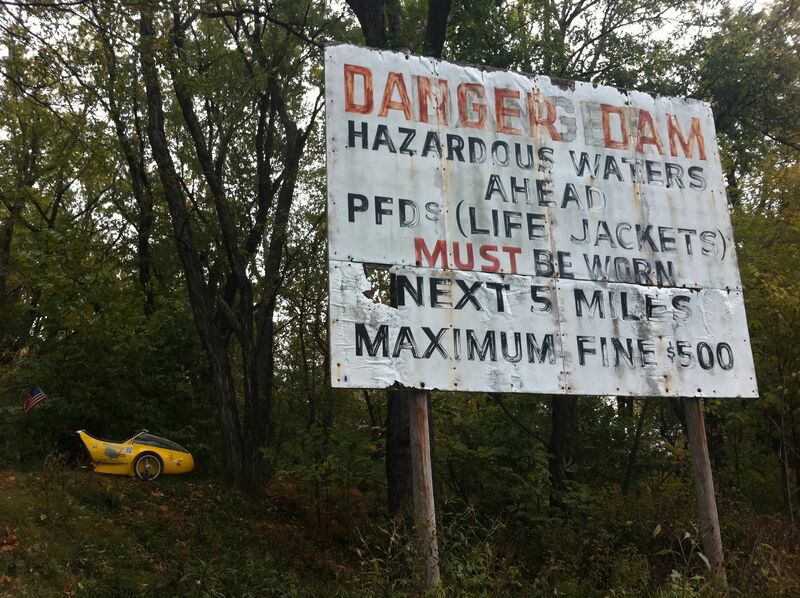 This time, there’s no electric-assist motor to help. It’s all on me and my two legs. 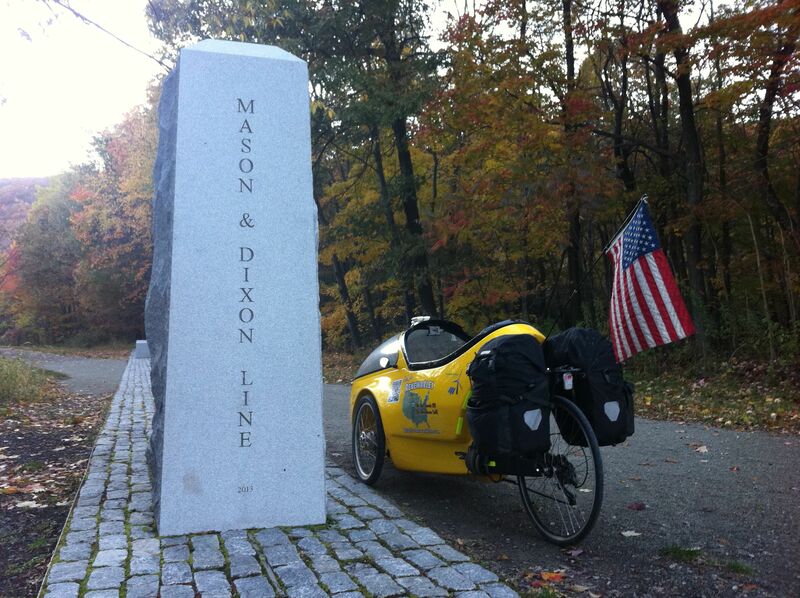 Saying goodbye to Pennsylvania and hello to Maryland at the Mason-Dixon Line (pictured here). Decided mid-day to try for Frostburg, MD and arrived just as it was starting to get dark. 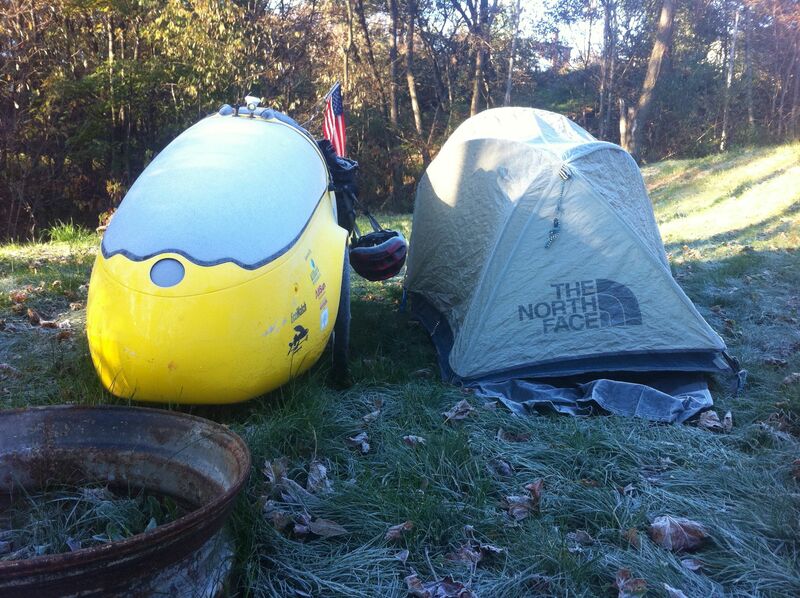 Frostburg is appropriately named: moments after rolling into the Travel Inn & Campground, everything in the trike soaked with sweat from the day’s riding was already covered in frost. Here’s what it looked like in the morning. The long, steep wooden ramp down to the showerhouse was also covered with frost, making for a treacherous descent in bike cleats (surprisingly more hazardous than anything I’ve encountered on the road the entire journey). I later padded back up the ramp in socks. Set up camp in the dark and scarfed down a freeze dried dinner before retiring to my tent to download photos and videos from the day. 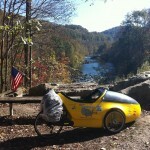 Logged 60 miles today, which wasn’t bad, given the late start leaving Ohiopyle. 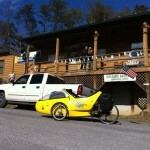 Day 13: After a hearty breakfast at the Inn, headed down the trail towards Cumberland. 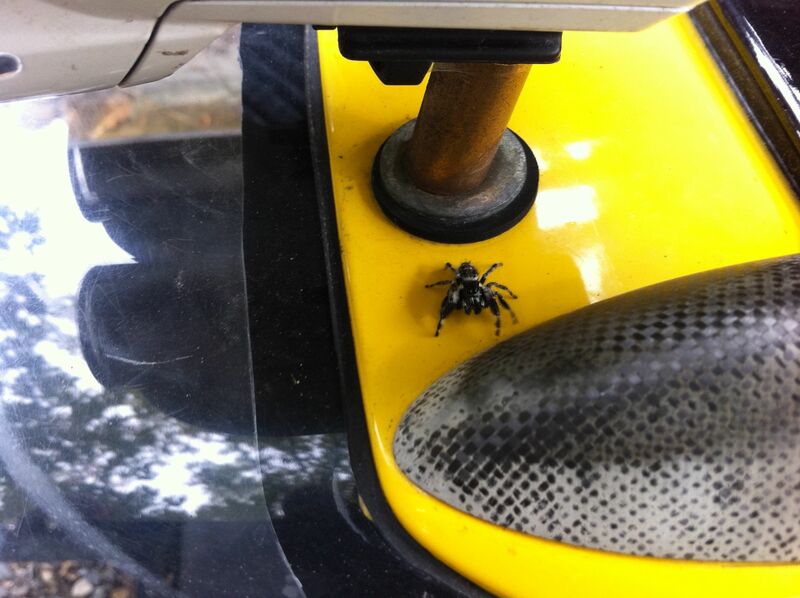 Being a major tourist destination, encountered lots of friendly cyclists on the path today. Thanks for the coffee cash, Marna! Passed the Cumberland Bone Cave (pictured here), which was discovered with bones from 28 species now extinct, including the Saber-Toothed Cat, mastodons and even a crocodile. A little further down the trail, encountered several beaver lodges. 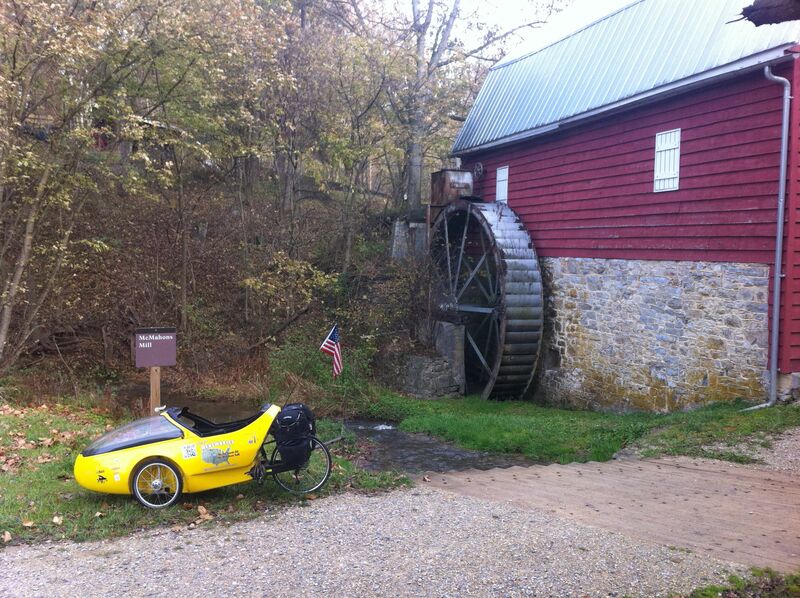 The one pictured here is across the C&O Canal, up and to the right of the nose cone of the trike. If you look closely, you’ll see a well-used beaver path leading up the hill to a food source: a tree with bark eaten away at the base. 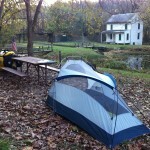 With 34 more miles behind me, reached the Potomac Forks campground (one of many free trailside campgrounds along the C&O Canal Trail) at dusk and spend the early evening hours sitting in the dark at my picnic table catching up on my blog. I was the only one there. The night was pitch black, and the only company the occasional insect that came to inspect the lit up screen of my laptop. Eerily quiet, except for the occasional passing train. 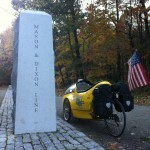 Day 14: Today was the toughest physical challenge yet of the journey. 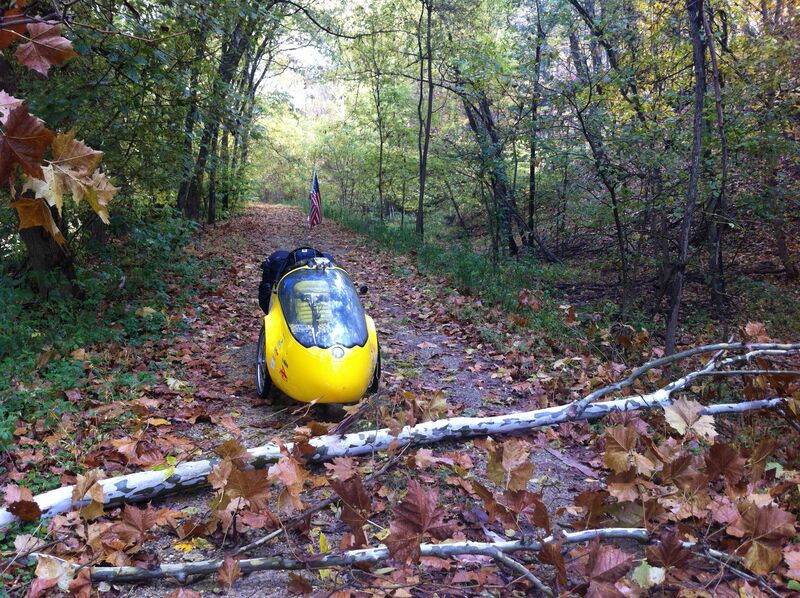 For much of the C&O Canal Trail, the path is too narrow to easily accommodate the trike, so lots of extra work is required. 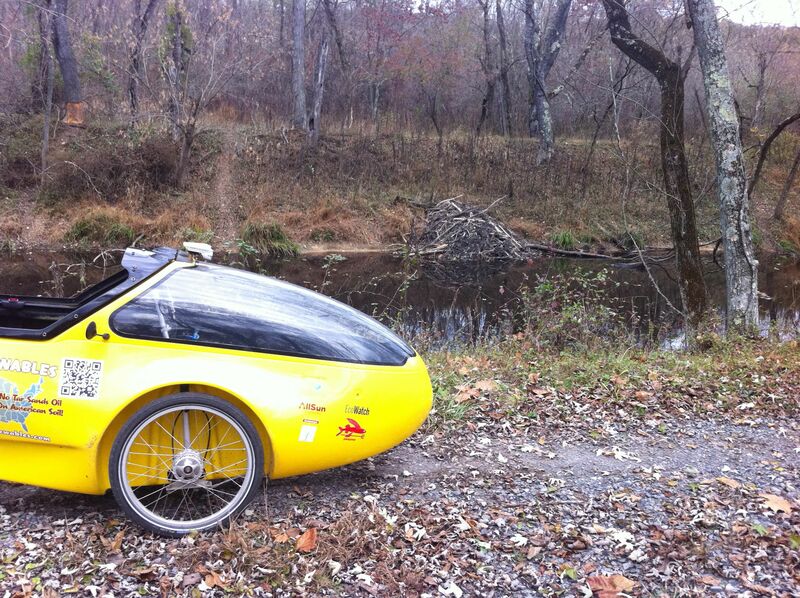 When I came through in 2010, I had the electric assist motor to help push me through. This time, my legs are providing 100% of the power. 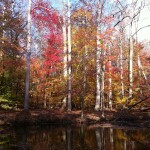 I set out on this trek desiring a physical challenge, and I’m getting it. 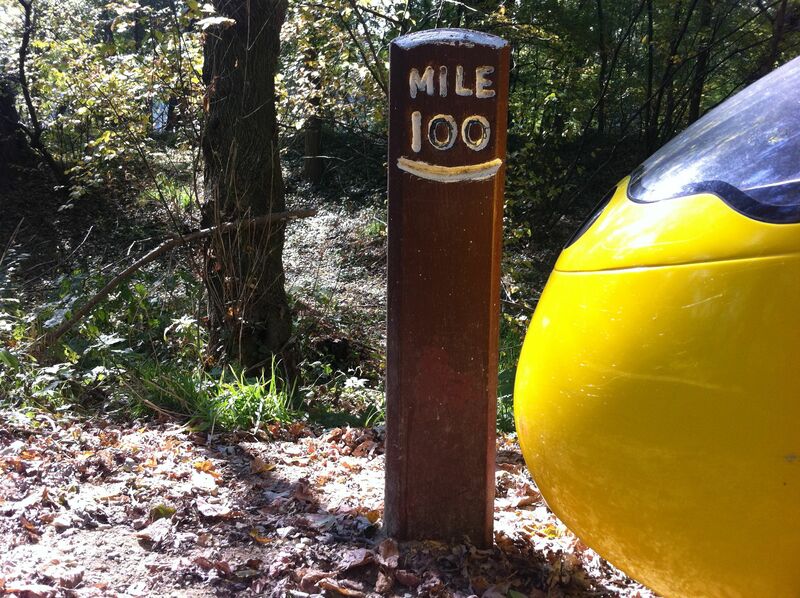 Here you work for every mile. This morning, while breaking camp (pictured here: note the historic Lock House in the background), I encountered one Daddy Long Leg after another. 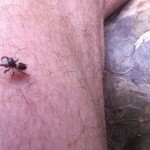 Some were slowly walking across the tent, maybe attracted by the residual warmth. I found another standing on the picnic table, seemingly trying to warm itself with the morning sun. I gingerly moved them to the grass so as not to step on them as I packed up. I’ve always been a big fan of Daddy Long Legs. I really need to learn more about them. By mid afternoon, with my rocket fuel running low and desperate for food, I remembered a bar right off the trail in Little Orleans called Bill’s Place (pictured here), the only place to resupply for miles. Instant oatmeal and energy bars only get you so far. I had stopped here during my 2010 ride and had signed a dollar bill “Renewable Rider” that is now affixed to the ceiling along with the thousands of others, but was too tired today to look for it. Ordered some lunch and washed it down with two frosty cold PBRs. Just the ticket. 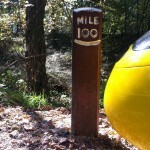 A few more miles down the trail was the paved Western Maryland Rail Trail, which parallels the C&O for 20+ miles. My knees were grateful for the reprieve and I rocketed to my evening destination of Hancock, MD, 40 miles closer to the White House. The trail took me right to C&O Bicycle, a bike shop/hostel complete with warm showers and screened-in bunks for just $10/night. 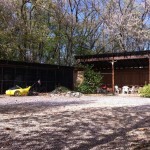 Got some dinner in town, then spent the night on the screened-in porch updating the last four days worth of blogs. 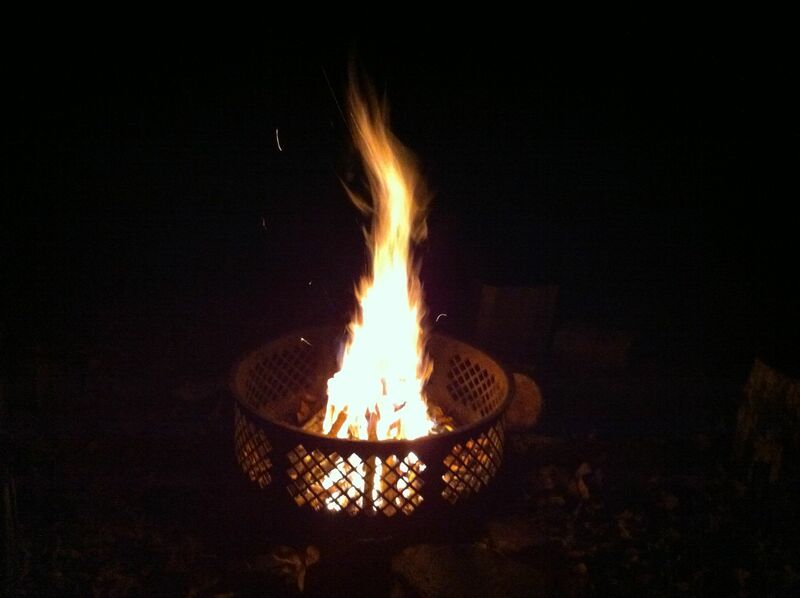 A chilly night, for sure, but hard to beat the price. Day 7: Spent most of the day inviting petition endorsers to our Nov. 7 White House action, but got down to the conference in time to hear the two-hour show on Keystone XL. Listened to some very powerful words spoken by some powerful speakers, but in two hours of talks, heard only one significant mention of Keystone XL’s southern leg, the section that is being built right now. 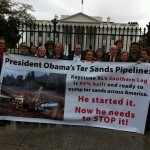 To his credit, Bill McKibben publicly acknowledged that the southern half of the pipeline is being built despite the brave efforts of Tar Sands Blockade and others, saying “we have to keep fighting that section, too, as best ever we can,” but then it was back to talking about the 2014 northern leg permit decision. If Keystone XL is truly “the iconic environmental fight of our time, and when you’re in that kind of fight, you need to win them,” why isn’t the focus on winning the fight in Texas and Oklahoma? The Big Greens have clearly given up on the southern leg and are moving on. How sad, and what a missed opportunity to rally thousands of young activists to take a bold stand against KXL’s southern leg, before it is too late and the Keystone tar sands spigot is turned on. Many of the activists I spoke with one-on-one at the conference were alarmed to learn that if not stopped, the pipeline’s southern leg is slated to begin transporting more than half a million barrels of toxic tar sands daily to Gulf Coast refineries by the end of this year. We will keep pounding the drum. Shared notes afterwards with my buddy John Friedrich, and got caught up on each other’s lives, before getting a lift back to my friend David’s place for some more great home-cooked grub. Day 8: After packing up in the morning, David dropped me off at convention center and I retrieved the trike from where I had stored it the last three days, before rolling down to the river for the Power Shift march through the city. It was an energizing and raucous march. Here’s a video I took that captured the spirit of the moment: “Rolling with Power Shift March in Pittsburgh” (note the smiling police officer behind the barricade who gave me a fist bump as I rolled by). The march received an enthusiastic response from office workers seen clapping and cheering from office buildings overlooking the march route. Later tracked down a splinter group in the courtyard of the County Courthouse, where about 30 activists organized a sit-in at County Executive Rich Fitzgerald’s office to protest plans to allow natural gas fracking in county parks. County parks?!? Unbelievable. Finally had to hit the road and swung by REI right off the bike path to pick up some freeze dried meals before heading east towards McKeesport. 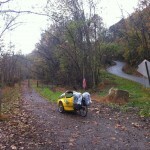 When I rode through three years ago, cyclists had to hug the shoulder of the road for about 15 miles to get to McKeesport. Now, the bike path starts in Pittsburgh, meaning you’re effectively on the Great Allegheny Passage once you cross the river out of the city. Passed a huge pipeyard (pictured here) near the town of Duquesne, no doubt being used to supply Pennsylvania’s natural gas fracking boom. 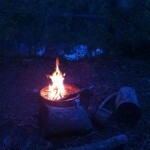 Arrived at the Cedar Creek campground right at dusk and was happy to find the lean-to cabin I used in 2010 unoccupied. 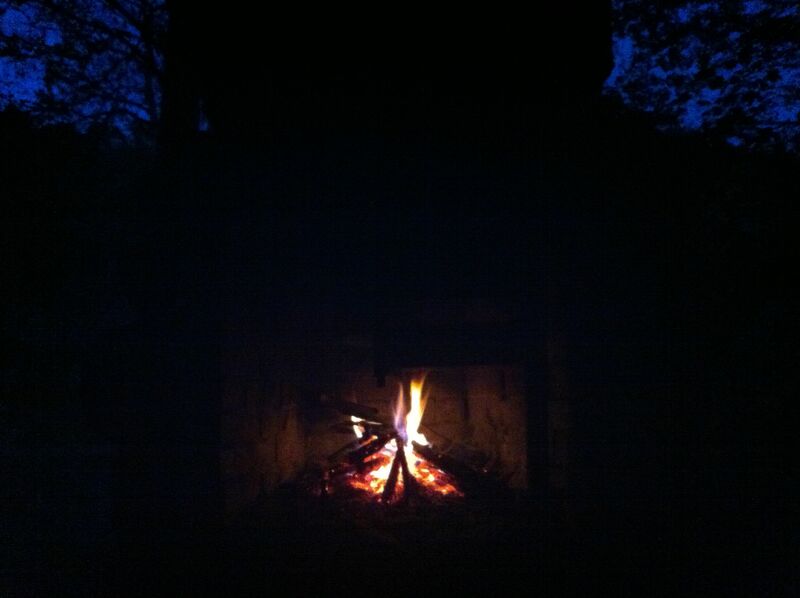 So got settled in, collected some firewood and built a fire (pictured here) to warm up the place. 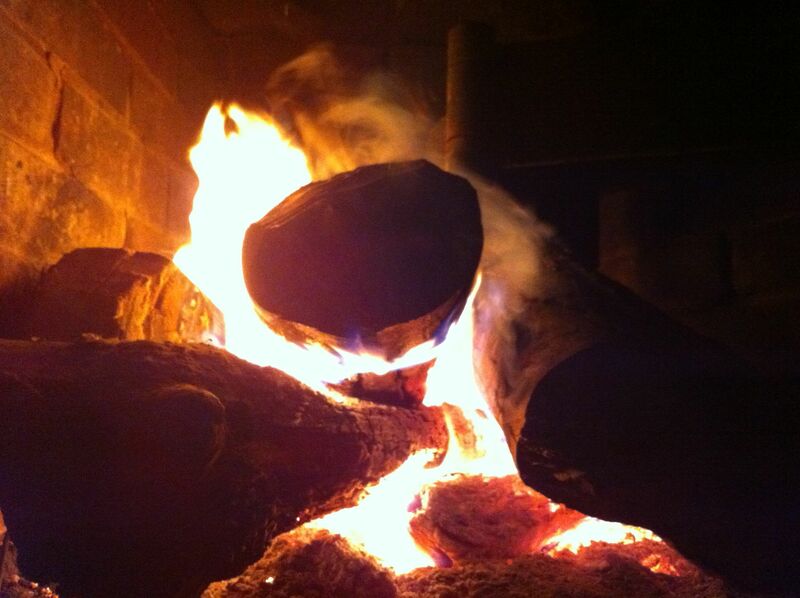 After dinner, tossed some big logs onto the flames to create a bed of coals hot enough to keep my cabin warm all night long. 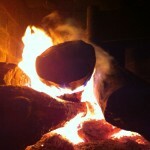 The roaring fire (pictured here) was beautiful. Pedaled a modest 38 miles today, which will be about average from here on in. Not in a hurry to get to DC and have lots of preparation work to do between here and there. Must savor the experience of this final ride. Day 9: Once the train traffic slowed down, got some good sleep and woke up the sound of falling rain and a bed of coals still warming my lean-to cabin (pictured here). By the time I packed up, the rain has stopped and the sun was starting to poke through the clouds. Hungry after 22 miles of pedaling on an empty stomach, found a diner serving breakfast all day in Connellsville, where I carb-loaded up. Then continued down the leaf-covered path next to my companion for the day: the Youghiogheny “Yough” River (pictured here in background). Took this shot to contrast a designated bike path that never exceeds a 1-2% grade with country roads cyclists would otherwise have to negotiate, with their endless hills and climbs and blind curves. Extremely grateful for all the work that went into building this trail. 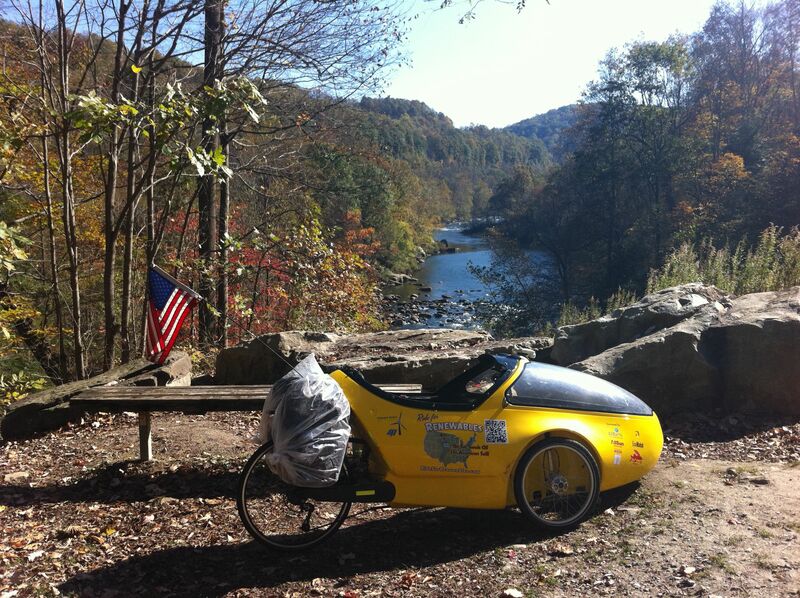 Mid-afternoon, rolled the rocket trike across a wooden bridge towering over the gorgeous river near the little town of Ohiopyle, PA. I took this video as I crossed: “Crossing the ‘Yough’ River.” The Yough (which I learned is actually pronounced “yawk”) makes a spectacular hairpin curve around the small town, creating Ohiopyle Falls. 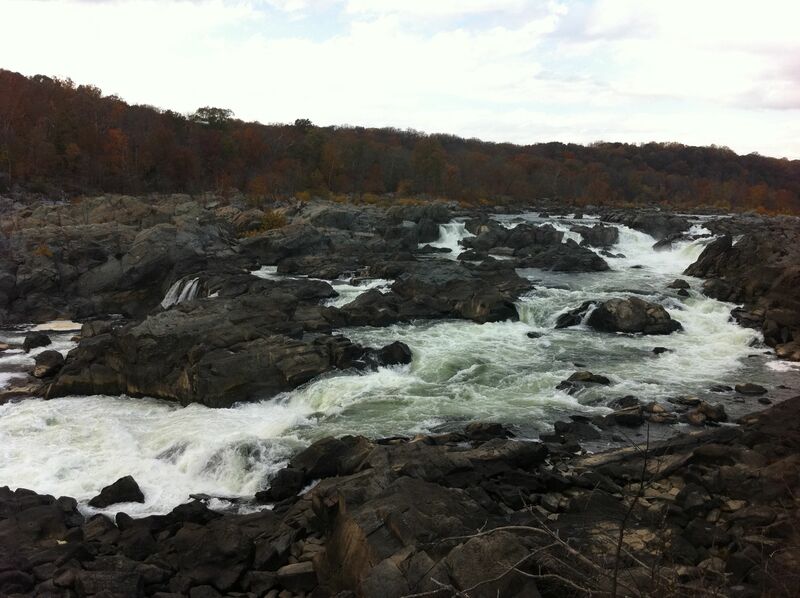 The “Loop” provides local kayakers with some of the best whitewater paddling in the eastern U.S. 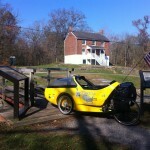 Holed up in a guesthouse for the night, after 38 more miles pedaled on the day. Day 10: Woke up to a cold drizzling rain outside with snow possible tonight, so decided to hunker down in Ohiopyle to make preparations for DC. Got out midday to explore the town by foot (which didn’t take long), but mostly sat in front of a computer catching up on the backlog of emails and phone calls. The weather forecast looks like more of the same tomorrow.